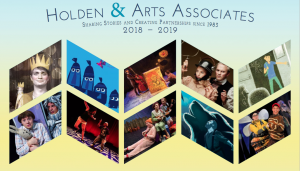 Holden & Arts Associates seeks a part-time Sales & Administrative Associate to assist in the booking and management of their roster of award winning, international and national performing arts companies. Sales Associate – Be familiar with the artistic content and technical needs of HAA’s touring roster; Attend weekly calendar meetings to chart tour routes; Research prospective presenters; Update and maintain HAA’s database (Filemaker Pro); Support HAA sales and conference efforts with appointment requests and follow up mailings; Work closely with other HAA Booking Agents and support HAA sales efforts with emails and phone calls to presenters as required; Support and build positive, ongoing relationships with presenters and artists. Tour Logistics – Arrange hotel accommodations and travel for touring companies as needed. HAA Finance Management – Work closely with HAA Co-Director regarding Accounts Receivable and communicate with presenters re past due deposits and balances; Process checks (identify, photocopy, deposit). HAA Contract Management – Work closely with HAA Co-Director on managing contract follow up and communicating with presenters regarding past due contracts. HAA Marketing efforts – Work closely with HAA Co-Director to prepare hard copy and electronic mailings. Administrative Support – Answer phone; Take messages; Mail/Bank/Supply runs; Other related duties as needed. We are looking for someone who will have passion and experience in the performing arts, be detail-oriented, and possess excellent communication skills, both verbal and written. Applicants must be self-motivated, able to multi-task, have good time management skills, and enjoy working as a collaborative team member in a small office environment. Ideal candidates will have experience in some or all of the following: sales, project management, bookkeeping, education or arts education, performing arts, and knowledge of touring and/or presenting field. Candidate must be proficient in Microsoft Word and Excel. Some on the job training and professional development opportunities will be provided. Job specifics: Part-Time. 15-20 hours a week. Location: Hyde Park neighborhood, Austin, TX. Compensation: $15 per hour. All major holidays off with pay. Some travel required, including weekends. Access to reliable transportation for weekly errands required. All applications should be sent by July 3. No phone calls please. We will respond to candidates we wish to interview.